Green Rewards Green Rewards is an interactive programme which rewards staff for their sustainability and wellbeing actions. Green Rewards encourages positive sustainability and wellbeing behaviours within the BU community while also helping staff to meet their own personal goals. So why not get involved? Welcome to the latest edition of InsideBU – the magazine that shares some of the enriching and inspirational stories from the BU community. We have now firmly embedded our BU2025 vision and strategic plan which highlights our key values of excellence, inclusivity, creativity and responsibility. In this issue of InsideBU we take a closer look at one of those values – inclusivity. As a university we aim to provide an inclusive, supportive and welcoming environment for our students, staff and visitors and support development, progression and achievement for all, so that all can thrive. We can only accomplish this with the support of the BU community and we need feedback from all our stakeholders. On page 11, you can read how our Student Reps are integral to this; by representing the collective student voice, they help us to make important, positive changes across BU. How to submit If you would like to submit a story for the next issue of InsideBU, please email insidebu@bournemouth.ac.uk. We reserve the right to edit your copy and the editor’s decision is final. Printed on FSC certified paper from sustainable forests. One way BU is ensuring that we build a more diverse community is through our Schools Liaison and Partnerships Team. The team work with primary school children through to mature students to encourage more people into Higher Education. They also highlight opportunities to potential students regardless of their social background to encourage them to find the path that’s right for them. Find out more about their work on pages 8 and 9. We were delighted last year when internationally respected journalist and our front cover star Kate Adie became our Chancellor. In her interview on pages 6 and 7, Kate reflects on the opportunities this country offers for a good education, compared to many parts of the world she’s visited. She also discusses how university isn’t just about gaining an excellent education, but also about meeting people from different backgrounds. As always, we want to hear your feedback so please do continue sharing your stories and successes at insidebu@bournemouth.ac.uk. News from around BU Local Government reorganisation Last year the Government authorised the creation of a new local authority called Bournemouth, Christchurch and Poole (BCP) Council, plus a second unitary council for the rest of Dorset. President of the Students’ Union Bournemouth University (SUBU) We all had a great first semester settling in to our new roles! Black History Month was full of celebration with film screenings, guest speakers and debates all focused on empowering students to make our world more inclusive. The BME (Black and Minority Ethnic) Awards in December recognised the immense contributions made by Afro Caribbean, Black and Asian BU students with performances by the Performing Arts society, K-Pop society and the Gospel Choir. In addition to this our Students with Disabilities liberation campaign held its annual winter conference, providing a space for fellow students with disabilities to meet, find out about the liberation campaign and discuss accessibility on campus. This semester there’s lots planned. For starters, our LGBT (lesbian, gay, bisexual, and transgender) Plus and Trans and Non-Binary Students liberation campaign is hosting an entertainment night called ‘Queer Jam’ at The Old Fire Station and the Black Students liberation campaign is organising an event called the ‘Arise Conference’ for an explosive night of word, prayers and worship. We’ll also be sharing more information about the national ‘Why is my curriculum white’ campaign, which encourages students to reflect on representation in their curriculum. Find out more about what’s going on at your Students’ Union at www.subu.org.uk. The council will replace the existing authorities of Bournemouth Borough Council, Christchurch Borough Council and Poole Borough Council. This will come into being in April 2019, and Dorset’s current nine councils, including Bournemouth Council, will cease to exist. councillors and as a result BU will be hosting upcoming meetings for the newly established BCP council. Bournemouth, Christchurch and Poole Council will serve around 400,000 residents, putting it within the twenty largest local authorities in the country. Find out more about the new local authority at www.bcpcouncil.gov.uk. Graduate Outcomes Survey The Graduates Outcomes Survey – which will start this year – replaces the Destination of Leavers from Higher Education Survey and aims to find out what graduates are doing in terms of work or further study six months after university. This new national survey will let us know how we are equipping our graduates for employment and where their degrees have led them. It will also help future students to make an informed choice about their university and course. If you are graduating this year, you will be contacted 15 months later to find out what you’re doing. The survey is led by an external organisation, but BU will contact graduates closer to the time to make sure all contact details are up to date. The award is valid for three years and during this time the department will continue to raise awareness of gender equality within their teams. designated charity and corporate partners, and will split their time between BU and the partner offices. The Fusion Fundraising Academy will be a pioneer in its field and will offer exciting opportunities for students, charities and corporations to shape the future of the fundraising profession. Our gender pay gap report for 2018 has shown that the gender pay gap at BU has started to decrease. We are confident that men and women are paid the same for doing the same work, but we do still have an uneven distribution of men and women across the pay and grading structure. This is due to historical and societal factors and we are committed to removing the gap. Our gender pay gap report includes some of our key achievements towards gender equality. You can read the full report on the Equality and Diversity section of our website. 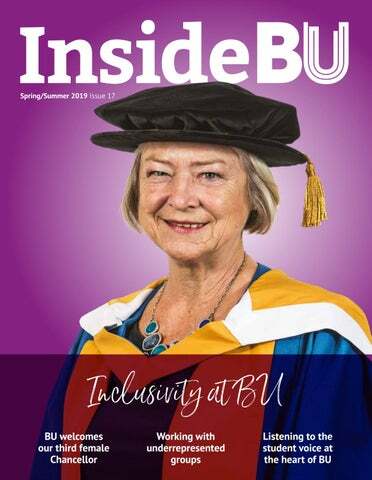 InsideBU talks to distinguished broadcaster and writer Kate Adie, who became the university’s fifth Chancellor at the start of this year. As an internationally respected journalist, Kate was the BBC’s Chief News Correspondent from 1989 to 2003, covering major international events. Appointed OBE in 1993 and CBE in 2018, she has won multiple awards, including a BAFTA Fellowship in 2018 – a lifetime achievement award and the highest honour the academy can bestow. As Chancellor, Kate is the ceremonial head of the university and her most public role is to preside over BU’s annual graduation ceremonies, presenting degrees to students. She will also attend other university events and serve as an ambassador for the institution in the UK and beyond. How did you feel when you were invited to be Chancellor? How do you see the importance of higher education generally and particularly in the field that you were in for so long? In what ways do you believe university can prepare you for life after graduation? “I’m old fashioned perhaps in that I believe university is about learning to think. To think about everything, to question, to debate, to argue, to wonder about things, to pursue all kinds of avenues. It’s about learning to think and that basis is an absolute essential, not only for success but for a more enriched life. “What I think– and I hope – is that learning is something that doesn’t stop when you leave university. You realise that learning is the basis of getting to grips with the unknowable and difficult: the contentious, the challenging. Learning is how you begin to cope with it and it’s a wonderful lesson for life.” To listen to the interview in full please head to www.bournemouth.ac.uk/kate-adie. InsideBU speaks to BU’s Schools Liaison and Partnerships Team (SLP) that works with primary school children through to mature students to encourage more people into higher education (HE). This summer, 160 young people aged between 14 and 17 years old will stay on the BU campus for three nights, as part of the SLP’s Summer Breaks initiative. This residential experience provides a ‘taster of university life’ and is part of a full programme of activities that’s underpinned by the belief that every child with the ability to succeed should be able to take advantage of the benefits of HE, if they so wish, whatever their social background. BU staff are supported in the delivery of these activities by Student Ambassadors, who are current students. Ambassadors act as mentors and help the participants settle in. They are also able to inspire others by sharing their experiences of university. Attending Summer Breaks is often the first time students have been away from home and the intention is to not only provide a real insight into what’s on offer for an undergraduate, but to give a balanced view of the other HE options available. With a real focus on working with students from primary schools that progress into our target secondary schools and ensuring sustained contact throughout the academic year, the relativelynew SLP team continues to impact on school children who would be typically less likely to progress to university. The programme supports BU’s commitment to widen access and encourage progression into higher education, whilst recruiting future students to BU as outlined in our registration documents, approved by the Office for Students (OfS). The continued aim is to integrate themes around HE, careers and progression, within the national curriculum. Summer Breaks is just one activity of a full programme aimed at age groups ranging from primary to mature students. One of the joys of HE is studying alongside a diverse demographic and learning from one another’s experiences. Returning to education is a big decision and many mature students are concerned about how to juggle studying alongside family commitments, how they are going to support themselves financially, and are nervous about getting back into academia after taking a break. The decision-making process for mature students often differs from school leavers, and the SLP team delivers presentations and workshops tailored for this audience to help navigate them through the process, as well as recruiting current mature students to work as ambassadors who can share their own personal experiences. The SLP team increasingly works with faculties, professional services and SUBU to support BU’s engagement with schools and colleges. For example, the team is working with Bournemouth Children’s University and SportBU to provide weekly events for eligible students and their families, themed around health and mental wellbeing. They also delivered 10 Access to HE Workshops to nearly 200 mature students. of students attending our residential Summer Breaks Programme in 2018 would be the first in their family to progress to HE. Making HE feel tangible Every year around 150 young people participate in the Summer Breaks Programme. After attending, there was a 39 percentage increase in the proportion of participants who agreed that they would fit in at university1. The team offers various options to people of all ages to help them overcome any potential barriers that may stand in the way of their chosen career or higher education path. To find out more, please email schoolsliaison@bournemouth.ac.uk. A recent Universities UK (UUK) national campaign, MadeAtUni, celebrated a number of UK universities for their contributions to society and everyday life – including the work of BU’s Orthopaedic Research Institute (ORI). To read more about how ORI is featured in the MadeAtUni campaign, please visit www.madeatuni.org.uk. Student voice at the heart of BU The student voice can be powerful and SUBU – the Students’ Union at BU – is the driving force behind it. Known as the ‘Purple Army’, the Student Reps are probably the most familiar string to SUBU’s representation bow. With around one Student Rep per 20 BU students, all fully trained to collect feedback from students on all aspects of their experience, this is a truly powerful way for students to have their voice heard on a range of topics from facilities, support services, catering, and buses to academic matters. Supporting SUBU’s “collect it, represent it, share it” mantra, the Reps use SimOn, SUBU’s simple online tool for collecting feedback, which is then disseminated across faculties and services at BU. Student Reps use this at course level, and the Senior Reps use department level data at monthly Senior Rep forums with the FullTime Officers. This information is also analysed and reported on by SUBU’s very own Insight and Policy Team who provide evidence-based research about the student experience that informs the work of the FullTime Officers, as well as contributing to policy development and change at BU. There’s also the six liberation campaigns introduced in 2016, which have been a successful addition to SUBU’s Democracy and Equality Team, allowing students to connect, highlight issues and raise awareness and challenge discrimination. Successes include Black History Month and the Transgender and NonBinary Students’ Campaign’s promotion of the pronoun toolkit to familiarise students and staff with ways of using gender neutral language. However, talking to, or being, a Student Rep isn’t the only way of influencing student life and ensuring representation at BU. The democracy and equality department organises the SUBU elections, the Executive Committee, Big Student Meetings where hot topics are debated to drive forward change, and campaigns and events to bring the BU community together, such as Student Pride and the BME (Black and Minority Ethnic) Awards. 2019: Year of Green Action The 25 Year Environment Plan – which sets out the government’s plan for an improved environment – highlights 2019 as ‘The Year of Green Action’. InsideBU finds out what steps the university is taking to participate. With sustainability at the core of BU, the university is always looking into ways to develop more sustainable surroundings while encouraging individuals to embed our goals into everyday life. The Year of Green Action is a campaign designed to engage people with environmental issues under three themes; connect, protect and enhance. Focusing on the theme of ‘protect’, which highlights how communities and businesses are reducing their impact on the environment through greener decision making, InsideBU asks how BU is making our place of work and study as sustainable as possible. Sustainable buildings All major BU estates projects must achieve the ‘excellent’ rating through the Building Research Establishment Environmental Assessment Method (BREEAM), as a minimum. BREEAM is the benchmark standard for the construction of environmentally sustainable buildings in the UK. UNIBUSES Our fleet of UNIBUSES buses are the most environmentally friendly buses BU has commissioned to date. They have some of the most advanced technology fitted to reduce emissions and improve fuel economy. They’re also equiped with technology which automatically switches off the engine when the vehicle stops, which eliminates engine idling, improves local air quality and reduces noise pollution. Solar panel power In a continued effort to reduce the university’s carbon emissions, over 1,140 solar panels have been installed at Talbot Campus. These generate over 303,000 kWh of renewable electricity per year – enough to power about 100 houses for a year. Reduction in single use plastic A number of important steps have been taken in a bid to reduce the amount of single use plastic BU uses. This includes replacing all plastic straws from our cafes with high quality paper ones, and replacing takeaway plastic salad boxes with fully biodegradable and compostable boxes. A plastic-free shelf has been introduced into all drinks chillers and plastic takeaway cutlery has been replaced with wooden versions. Green Rewards BU staff have been crucial to reducing our impact on the environment by joining the Green Rewards scheme, which gives participants the opportunity to be rewarded for their sustainability and wellbeing actions. In 2018, through this scheme, staff avoided more than 970kg of disposable coffee cup and plastic bottle waste, completed nearly 19,000 hours of exercise and travelled 240,000 miles sustainably to and from BU on their commutes. Green Loop project Led by BU students, the Green Loop project is a not-for-profit ethical food social enterprise. Concerned with the environmental damage caused from food production, a ‘poly tunnel’ has been created on Talbot Campus with the aim of growing organic vegetables to turn into fresh and nutritious meals for students. The project is dedicated to increasing awareness around the benefits of growing your own food; not only does it provide healthy fuel for people, it also enhances biodiversity in our green spaces. To find out more, please head to	www.bournemouth.ac.uk/subu-green-loop. While BU continues to look into ways we can invest in and develop more sustainable surroundings, as individuals there are many things we can do to embed our goals into everyday life. Part of this is delivering the UN Sustainable Development Goals. These address the global challenges we face, including those related to poverty, inequality, climate, environmental degradation, prosperity, and peace and justice. To find out more, please head to www.bournemouth.ac.uk/sustainability. –looking to the future The Business School is going to have a big 2019. Fresh from an AACSB (The Association to Advance Collegiate Schools of Business) accreditation in 2018, a mark of quality for the Business School and its courses, the School is now undergoing a refresh that will provide focus and drive as it moves forward. Fewer than 5% of business schools worldwide have received an AASCB accreditation and it shows that the School met high standards of excellence in all areas, with a focus on continuous improvement. Lois Farquharson, Deputy Dean for Education and Professional Practice within the Business School, said, “I’m so proud of our AACSB accreditation, it’s a real mark of quality for the work of the Business School, but this is just the first step. As a business school, we want to continually be pushing boundaries for our students, preparing them for a future where they must demonstrate a global mindset and behaviours to enhance their careers.” The accreditation is an international mark of excellence, also showing that the Business School has a global outlook to its future – with a number of international initiatives underway to underline how the Business School is pushing back against the Brexit blues and looking towards a bright future. One such initiative, which is taking the Business School across the world, is the BU Global Festival of Learning, which this year takes place in Vietnam. A delegation from the Business School, alongside colleagues from the Faculty of Management and the Faculty of Media & Communication, will be heading to Foreign Trade University, Hanoi, and the University of Economics Ho Chi Minh City to present their latest research, and lead panel discussions on what it means to have a global workforce. Other panellists taking part in discussion include Coca Cola. BU staff will be in Vietnam from 30 March , just a day after the original Brexit deadline day, showing that the Business School is looking beyond the EU, and won’t be restricted by the current political climate. The joint project looks to review current practices in Vietnamese higher education and benchmark them against good practice in the UK to understand and develop a framework for maximising the value of university-industry collaboration in Vietnam. This will be achieved through international partnerships for knowledge exchange, mobility and, ultimately, the development of quality industry-ready graduates in both Vietnam and the UK. The Global Festival of Learning – Vietnam is also being run in partnership with the British Council, as the Business School continues a project called ‘University-Industry Partnerships for Developing Work-ready Graduates’. This is putting the Business School at the centre of an international project, with Coca Cola, the British Council and two Vietnamese universities as key stakeholders in the project. The Business School also regularly provides opportunities for students to work, both in the UK and further afield, through its collaborations with industry, and the placement offer that many students undertake – showcasing the School’s commitment to Fusion; a globally-accredited Business School that creates, inspires and transforms responsible leaders through a fusion of experiential learning, professional practice and research. 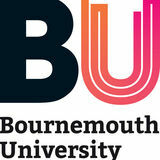 To find out more about the Global Festival of Learning please head to www.bournemouth.ac.uk/global-fol. BU student pedals the planet Vedangi Kulkarni, a BSc Sports Management student at BU, has become the first Asian and the youngest female to cycle unaided around the globe. InsideBU finds out more. The 20-year-old student from India began her 18,000-mile journey in July 2018, cycling around 180 miles per day across four continents and 14 countries, including the US, Canada, Finland, India and New Zealand, before finishing in Perth, Australia after 79 days. The journey provided additional challenges to overcome, including visa delays, a robbery in Spain, an altercation with a grizzly bear in Canada, and camping alone in sub-zero temperatures in the Russian snow. To read more about Vedangi and her experiences along the trip, visit www.vedangikulkarni.com. Alan Kirkpatrick is Head of Education and Professional Practice in the Accounting, Finance and Economics (AFE) department of the Faculty of Management. He’s also lead guitarist of ‘The Professors’, a ‘prog rock’ band that he formed after he joined BU ten years ago. As Head of Education and Professional Practice (HoEPP) in AFE, I’ve been overseeing a programme review of all the degree courses offered at undergraduate and postgraduate level. I really enjoy the role of HoEPP and during my tenure of 18 months (so far) AFE has played a big part in the Business School’s successful bid for accreditation by the prestigious Association to Advance Collegiate Schools of Business (AACSB), a status boasted by less than 5% of the world’s business schools. (See more on pages 14 and 15). At the end of every day I play instruments – mostly guitar and piano. I’ve been playing for as long as I can remember; my late mother, who was an accomplished pianist, said that I started playing recognisable tunes ‘by ear’ when I was two or three years old and I started formal classical piano lessons at the age of six. I took up guitar at 10 and have been playing guitars every day since! I played in rock groups at school and university and then family commitments and a career left less time to perform. I’m looking forward to more success following the AFE programme review, which was undertaken to ensure BU degrees are highly competitive, relevant and employability-enhancing for our students. I worked in professional practice and the financial services sector for around 20 years before becoming a full time academic and a big part of my role is to keep in touch with the businesses that are the employers and potential employers of our graduates and current students. Several years ago I formed ‘The Professors’ when I realised there were other academic musicians at BU who shared my interest in playing ‘prog rock’, which is a broad genre of rock based on a fusion of styles and approaches and frequently associated with jazz, folk or classical music. With my old friends Paul, Stephen and Wei-Jun on bass, vocals and violin I’ve enjoyed performing at BU events such as the Festival of Learning, the Vice-Chancellor Staff Awards and the SUBU Christmas Fair. Prog rock seems to be enjoying a revival so perhaps ‘The Professors’ will still have their day in the sun! development and employability. These courses can be from BU or other organisations like national sports bodies. RELAYS programme manager Andy Boland is working with two BU placement students, Terri Harvey and Zoe Wickham to provide RELAYS opportunities. Andy Boland RELAYS Manager and Lecturer in Coaching My role is divided between three areas: I’m the unit leader for the Principles of Coaching unit which is part of our undergraduate sport degrees, I’m the RELAYS Programme Manager, and I’m also the Head Coach of the TeamBU Futsal programme. students volunteering with RELAYS now and having Terri and Zoe to help facilitate and organise the opportunities means we can support all of the students that want to be involved. RELAYS offer volunteering opportunities including sports coaching and development but also events management, leadership and mentoring – it’s not just for sport students or those interested in sports. The opportunities are with a range of organisations, groups and businesses – from schools to Non-Governmental Organisations. Through volunteering, students are able to engage with industry, gaining invaluable experience to help them grow and develop for life after BU. We have recently been analysing data from BU graduates who have engaged in the RELAYS programme. All respondents have commented on the impact of the programme as they’ve moved from higher education into employment. We’re really proud of the lasting effect RELAYS has had on our students. I’m studying Sports Development and Coaching Sciences at BU and I first got involved in RELAYS by volunteering at the end of my first year. I first got involved in RELAYS during the second year of my Sport Psychology and Coaching Sciences degree. I told Andy that my main sport was gymnastics so he reached out to a local gymnastics club and I was given the chance to coach there. The opportunities provided by RELAYS have made me more confident and pushed me out of my comfort zone so I was really keen to help others reap the benefits when the opportunity for a placement with RELAYS came up. As general managers, Zoe and I have separate responsibilities and also work together on the day to day running of the RELAYS programme including managing the email and social media accounts. I focus on overseeing all of the events that take place through RELAYS and help to successfully deliver them. We recently completed a first semester review to showcase the work Zoe and I have done and to look at how RELAYS is growing. It was really exciting to see that we’ve already engaged with more students from underrepresented groups than we did last year – and it’s only been one semester. I enjoy the variety and flexibility of the role as it enables me to do what I love. I’m able to go out and coach on some days and other days I work in the office. To find out more, please email relays@bournemouth.ac.uk or follow them on Facebook @RelaysBU. Many of our Marketing & Communication colleagues took up a challenge to run every day in December to raise money for over 50 different charities. BU’s new Chancellor Kate Adie attended a topping out ceremony – which celebrates the construction of the highest point of a structure – at the site of the Bournemouth Gateway Building, which is due to open in 2020. 145 staff were celebrated at the most recent Vice-Chancellor Staff Awards which provide an opportunity to reflect on the outstanding work of BU staff. 338 members of staff were recognised through the nomination period overall. Work to both the Poole Gateway Building at Talbot Campus and the Bournemouth Gateway Building at Lansdowne Campus is progressing well. Welsh rugby referee Nigel Owens visited BU to talk about his experiences as a gay man in rugby, as well as the challenges he faced by keeping his sexuality secret. Nigel is the world record holder for most rugby test matches refereed and is the most capped referee in the Rugby Football Union. Lee-Ann Fenge and Jian Chang are two professors who have presented in the BU’s Fusion Inaugural Lecture Series which invites members of the public, staff and students to find out more about the university’s world of research and innovation. BU Senior Lecturer in Digital Media Design, Liam Birtles, created an immersive light artwork at Salisbury Cathedral, designed to capture the imaginations of visitors and drive tourism to the city. BU student Megan Bennett is set to work at the Women’s World Cup football tournament in 2019, having impressed during her placement at the 2018 men’s World Cup in Russia. Megan, studying BA (Hons) Television Production, will help to produce content for the broadcast of games. This year, 30 graduates worked on films spanning more than 17 of the shortlisted categories at the Oscars, including BU MSc Computer Animation graduate Theo Jones who worked on Christopher Robin.